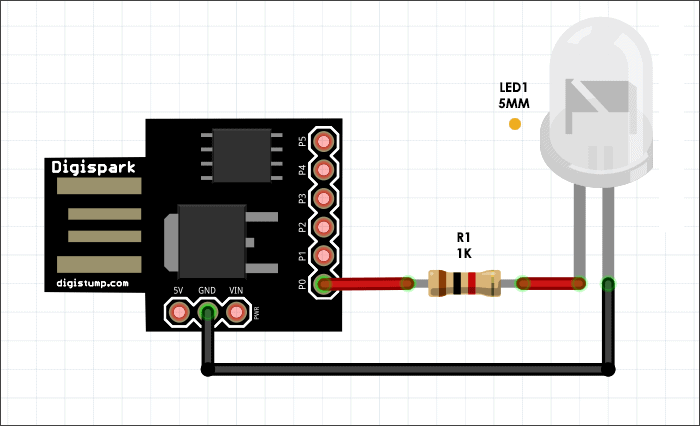 Here is a fascinating USB-powered LED Candle armed by the Digispark USB Development Board based on Attiny85 microcontroller. Thanks to Digispark – despite the lilliputian size, it’s packed with capabilities, and apart from having fewer I/O pins it can do most of what the microcontroller in the Arduino can do. 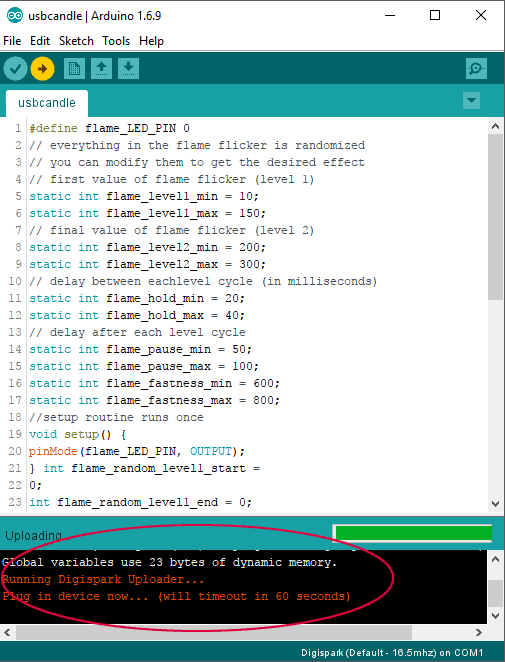 Further, you can program it from the same Arduino IDE used with your Arduino! Note that the golden yellow/amber LED is absolutely vital for this design. Other colors make a huge deviance, may be nice, but not commended! Take the needle of a plastic disposable syringe (matches with the diameter of the LED). Insert the LED in the hole of the needle holder, stick the LED inside, and cut the needle out (needle-cap of an insulin syringe can also be used for this purpose). The light is now nicely diffused, however, to get best results, mount this assembly at the top of a short-length thermal glue-stick. The LED candle light is mostly done! At first, note that bootloader code that is pre-programmed on Digispark allows it to act as a USB device so that it can be programmed by the Arduino IDE. 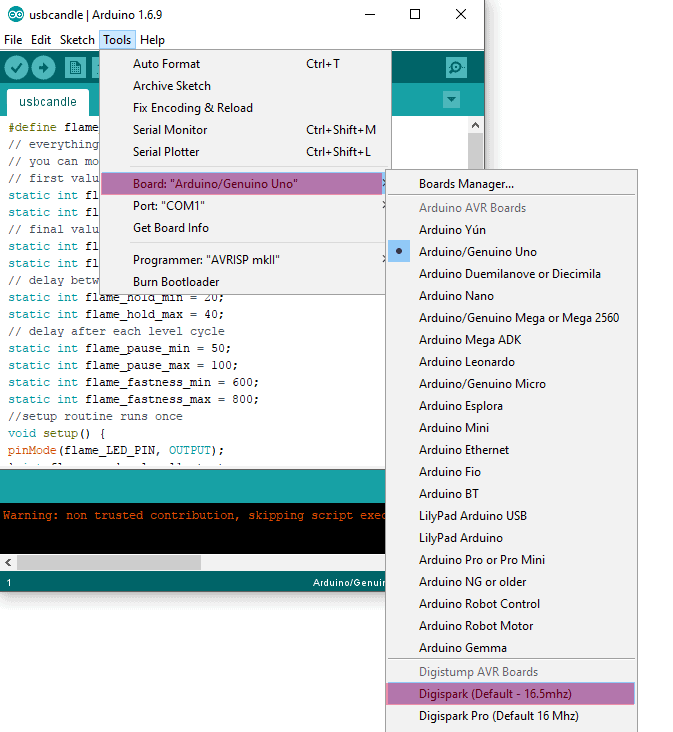 The Digispark uses the Arduino IDE 1.6.5+ (1.6.9 strongly recommended by author). Oh, I lost a part of what they said. 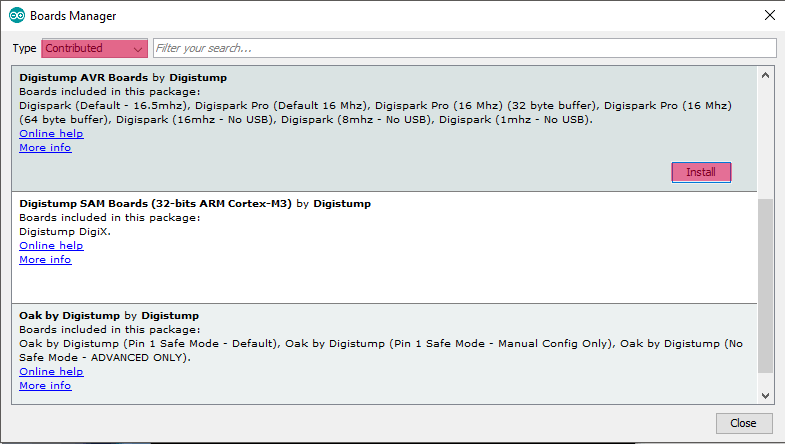 Sorry, before plugging the Digispark board (or running the Arduino IDE) you need to download the requisite driver, and create a folder named “Digidriver” (c:\Digidriver) or any directory. 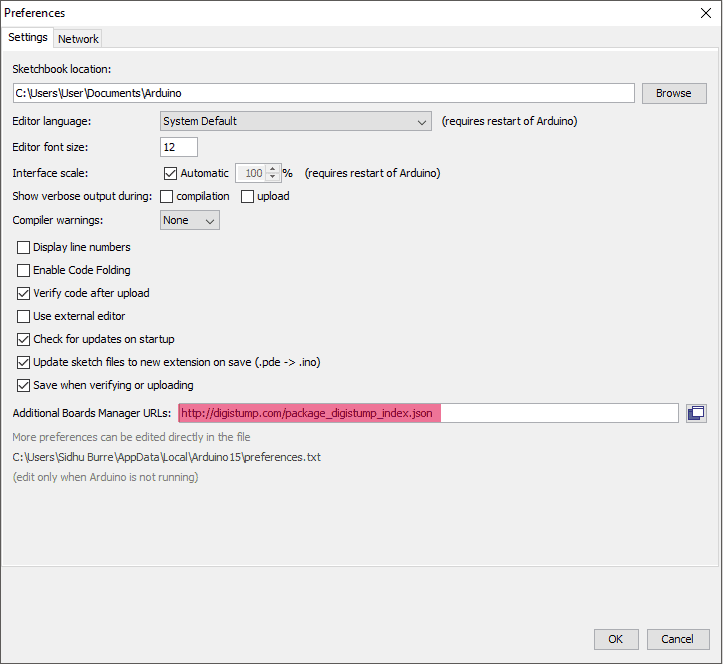 To install the Digispark Attiny board driver, go to this folder and run the InstallDriver exe file. 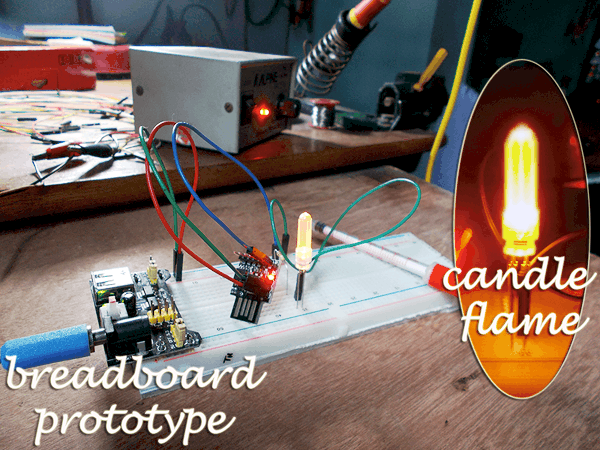 After this, you can start working on your first Digispark with Arduino IDE! Warning! The Digispark does not have short circuit or reverse polarity protection. Connecting power to the Digispark power pins backwards will almost certainly destroy it. When testing your finished project circuit I recommend that you should test it with an external power source first. Connecting a shorted circuit to the Digispark board and connecting it to your computer may damage your computer and/or its USB ports.